The 362 will surprise you by her performance on the water and interior volume. This is a superb yacht for two couples. For increased comfort, the lavatory even has a separate shower stall. 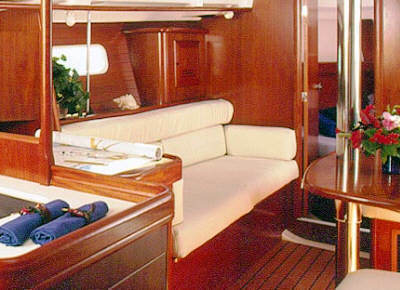 The 362 has two comfortable private double cabins - a v-berth forward and a huge double berth cabin aft. 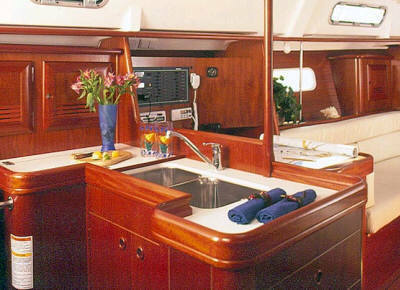 The large and spacious head is to starboard with a lavatory and a hot and cold shower in a a separate shower stall. 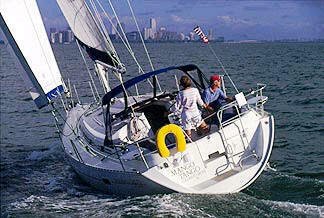 The Beneateau 362 has classic roller reefing, one wheel steering, electric anchor winch, autopilot and GPS. There is a bimini and dodger, dinghy with outboard, an ondeck shower and BBQ,AM/FM radio & CD player, fully equipped galley with LPG stove & oven, fridge/freezer, pre-charter cruising guides, full boat and chart briefing. Optional extras include a kayak, windsurfer, fishing rods, portable electronics, skipper, cook and a provisioning service.